National Bike Week – local fun! 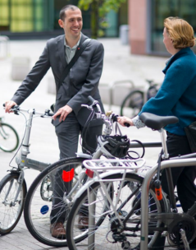 With National Bike Week upon us (16 – 24 June) and as part of the Decade of Health and Wellbeing, Merseytravel’s TravelWise campaign and Liverpool Primary Care Trust have launched Cycling Works! a fun new website designed to support, promote and increase cycling in Merseyside. National Bike Week is the UK’s biggest mass participation cycling event, with thousands of Merseyside cyclists taking part in activities ranging from Ride to Work days and the Wirral Bikeathon to Midnight Express, a twelve hour cyclist relay fundraising event. Cycling Works! will feature regular FREE OFFERS such as events, prizes, cycle maps, adult cycle training and maintenance sessions.